Looking at my post from yesterday I am reminded of my optimism, which I will continue to have because it's all that keeps me going. In the meantime I will take this time to be quiet, introverted and cleanse. It could be easy to turn to other things (especially since there are more legal forms now in many states) but I challenge you to take this time to become stronger, ignite from within, maybe this will become an impetus to meditate, strengthen your mind body and spirit - to stretch, eat better and show this country where it's strength lies. It was a very long night in the USA with the election of a new president. I've been on social media and there is a lot of complete shock and disbelief, and I have been hearing from many of my clients since the announcement. Indeed, if you are involved in many progressive ideas about the raising of our children, the state of our natural environment, women's rights, etc - then this election has been pretty shocking. But, it has me thinking as well. When I began Nonchalant Mom in 2004 the political climate was not very different from what happened today. My ideas for what I wanted to do with my business and how I wanted to present and run my business may have been a little more surprising and out of place then, but the core ideas remain the same. Needless to say, it was a challenge then, and is still a challenge now, to declare that you want your business idea to respect small crafts people and designers, that I want my business model to be a holistic benefit from the creators of many of my small labels I represent right through to the way I present the items I sell. I wanted to find things that showed respect between peoples and also respected the environment in the best ways possible. I didn't want to disregard the maker's and manufacturers of the things I sell/sold. I wanted to treat them with respect, I wanted them to treat me with respect and most importantly, I knew then that I was interested in small manufacturing, choosing to work with people who are respectful of their manufacturing process and people. I wanted to do something that felt right - something that felt good for both the people who make and provide beautiful things and for the people who would become my clients and buy and wear (or use) those beautiful products. And, though it looks like the social and political climate here in the USA (if not the world in general) is going to take a turn for some unsure outcomes - I felt it was and is very very important to remind myself and to remind any of you who follow and support my business I am invested in you as well. A good solid fight for the progressive ideals I built my little business on top of - a good fight for our children, for our family, for our friends, and for ourselves to do and make things that we all can use and enjoy. As always this also involves food so here's a good way to start - bring your lunch with you to work, play or to keep yourself from not eating snacks or food that is not good for your body. This photo is my lunch (well just one of the jars). I make brown rice a few times a week and we either use it for dinner and then I use the leftovers for lunch. I mix in roasted vegetables, nuts, steamed greens or even last nights leftover salad! 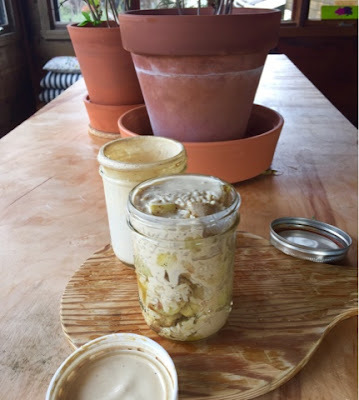 I keep a jar of my home made tahini in the fridge to drizzle on top (that's the second jar) and I honestly can't think of a better, more satisfying lunch. I heat it up in the morning so that it's at least luke-warm (which is fine and delicious too) by the time I eat it (yes, I could maybe use a thermos but I am a little too attached to these jars).